Rocky Lalvani, blogger at Richer Soul, shares his story of growing up as an immigrant’s child, learning how to save money in his early years, and how he’s teaching his own children about finances now. Rocky’s parents came to the U.S. in 1968, when Rocky was 2 years old. 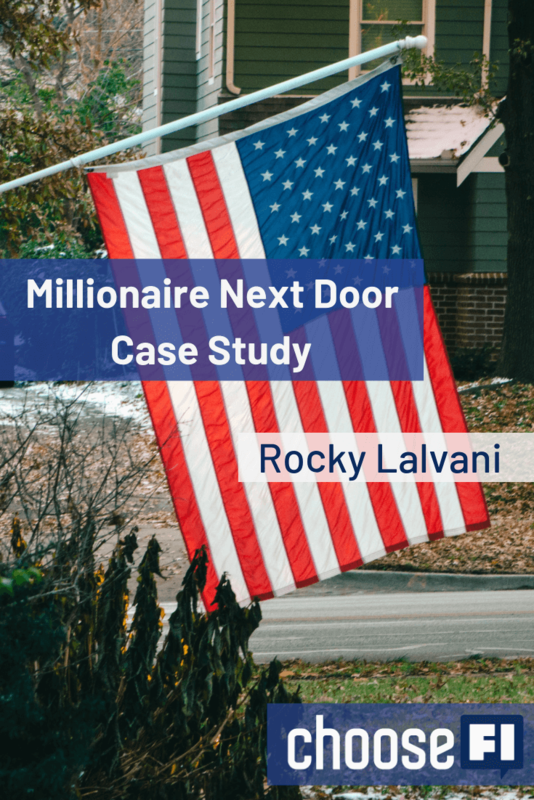 Among Rocky’s parents’ friends and their community, money was an open topic, and in pursuit of the “American Dream” his family consistently climbed the financial ladder. When Rocky was 7 his father became a single dad, and Rocky started learning how to be more independent, personally and financially. Paying attention to what customers and supervisors actually wanted helped Rocky advance at work. How much was Rocky saving when he was working in his youth? Rocky worked through college by delivering pizza and working at the university, finishing without any student debt. When he got his first post-college job, his dad helped him set up all the available automated savings accounts – 401k, company stock, etc. After realizing he needed to get out of consumer debt, what was Rocky’s strategy? Rocky’s plan was always to be a millionaire – he had been calculating and trying strategies since early on. Seeing people lose their life savings in an economic downturn motivated Rocky to get himself into a steady financial position. What steps did Rocky take to get himself to FI? Always spent less than he made. Rocky paid off his mortgage as early as possible. How is Rocky teaching his children about money? At this point, Rocky’s children are young adults – they don’t need things to be confident. Rocky wishes that in addition to teaching how to save money, he had also taught his children to earn money. Rocky’s strategy to help his daughter do well on the SAT, and hopefully earn a good scholarship, was to download an app on her phone and answer one SAT question a day for three years, prior to taking the exam. Earning a scholarship to college is a sliding scale – a student might earn scholarship at a lower tier school, when they would not earn anything at a “better” school. Rocky and his son went a step further and did their best to figure out how to pay for college with the lowest price tag. Thank you for the honor of allowing me to join you on the show. I really enjoyed the conversation and sharing my path. Did Rocky mention what line of work he is in? Maybe I missed it. Steve, I have been in sales my entire working career. I appreciate that Rocky mentioned the issue with private scholarships (that they’re not easy to get). On ChooseFI in the past, it seems they’ve highlighted the success stories related to private scholarships, and acted as if the scholarships are easy to get. I don’t think Brad and Jonathan realize that in reality, these scholarships are quite difficult to get. I graduated high school in 2000, applied to many many private scholarships (writing essays for each), and got none. I DID however, qualify for the merit-based scholarships that Rocky spoke of at my college for having a good GPA and high SAT scores. Thanks Rocky! You can get private scholarships but you really have to create a story behind yourself. Also being needs based opens a lot more doors. Where you live and what you want to study also plays a role. Great podcast, really enjoyed hearing Rocky’s story. Whether first-generation or many generations ago, as Americans we are ALL children of immigrants. It’s nice to hear different perspectives from various cultures, and to be reminded that the American Dream is alive and well (despite what our ‘popular culture’/media may try to tell us to the contrary). What wonderful values to instill in our children… education, HARD WORK, service, LBYM, saving for the future. I hear evidence of shared values with the ‘everyday millionaires’ interviewed often on Dave Ramsey’s show. So glad I discovered ChooseFI, and I’ll be sharing your blog and podcast with whomever I can! When Rocky mentioned about the generations and the effect or potential effect to wealth and economic status in life, it resonate to me since I am also an immigrant. I am hammering (this might not be a good word) my kids with books, videos (watching weekly) etc about values and financial improvement to help me mold their minds. But still remains to be seen since my eldest still in HS freshman. But I am glad to hear Rocky for he’d been there and done that kind of thing. I am sure you have done a fine job. Don’t hammer them, lead by your actions, it’s a lot more powerful than your words. Thanks Rocky for sharing your story and some concrete examples of how to get there. I’m new to the ChooseFI community but have already gained much value from it. While I don’t quite have the wealth you have amassed, I have similar values and after paying off $30,000 in debt went on to pay our home off. I’m about to finish paying for our 2nd kids school but they have had to work to contribute. It was refreshing to hear someone who could pay for it say “no, I’m not going to just write a check.” I had little success in helping my kids find scholarships and could have been tougher but at least they won’t be saddled with loans. I’m now a Financial Coach education and supporting others to learn some skills and I’ll be sharing not only this podcast but look forward to reading your blog! Look for me at Pennywise Coaching as I help spread your story and ChooseFI! We all do our part as best we can. It’s so awesome you are helping others learn skills and make better choices! Interesting podcast. Wish we had heard more about what generated his wealth, lessons learned around investing in various vehicles–I’d also love to know when he thinks the curve starts going up significantly–$1 million? $2 million? My wealth came from a decent savings rate and that I started early at 21 years old. The second factor later in life was a high income which led to a high savings dollar amount. We have always lived below our means and quite frankly it’s been a slower path to wealth than those are much smarter about this then I am. The curves go up significantly at each point. Your first $1,000 is hard, your 2nd $1,000 is easy, Your first $10,000 is hard, your 2nd $10,000 is easy. Your first $100,000 is hard, your 2nd $100,000 is easy. Your first $1,000,000 is hard, your 2nd $1,000,000 is easy. Enjoy each milestone and decide what’s enough for you. Stocks are easy but slow growth. Real estate is work it’s not passive and you have learn a lot of skills. You also should not over-leverage yourself as most people go bankrupt from that mistake. Setting up a side hustle is a great way over time to build a lot of wealth if you do it right. It’s also a lot of work but can really be a lot of fun if you pick something you do for the love of it.